The article is an outline of a specific methodology of Lev Karsavin’s theory of Person. Explication of the essence of the key concept “Symphonic litchnost” as well as of “subject” and of “actual Being” takes place in the article. Being based on historical data, accomplished with historical, hermeneutical, ideographical, nomothetical research methods the study offered an opportunity to avoid a miserable practice of an object-subject split in an act of cognition. 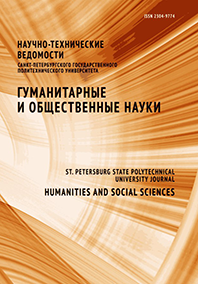 The conclusion of the study was to define Karsavin’s study of “symphonic litchnost” as a unique epistemological concept of one of the key Russian philosophers of the XXth century. Scientific results withdrawn from the undertaken study became a foundation of the special course of lectures “Lev Karsavin’s Philosophy”.